Beautiful stitchable Fabric Paper without messy glue starts with kids’ construction paper. It's fun! You can't buy anything like it! Definitely not just for kids, either. Let's get started. Click the play button in the video below. Ordinary kids' construction paper becomes stitchable fabric-paper. Get your construction paper here. What are oil pastels? Learn how to use them. Buy a great set of oil pastels here. Don't eat them! 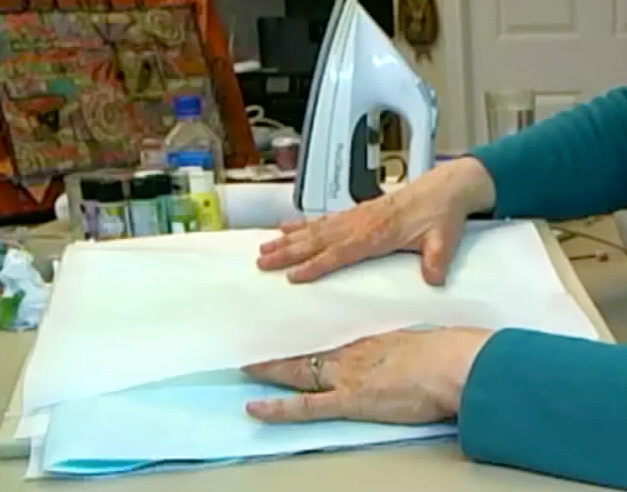 Get the Fusible Interfacing I use here. Get Wonder Under fusible web here. Learn to Squeeze Paper into Fabric. Did you ever knead bread dough? It's kind of like that! 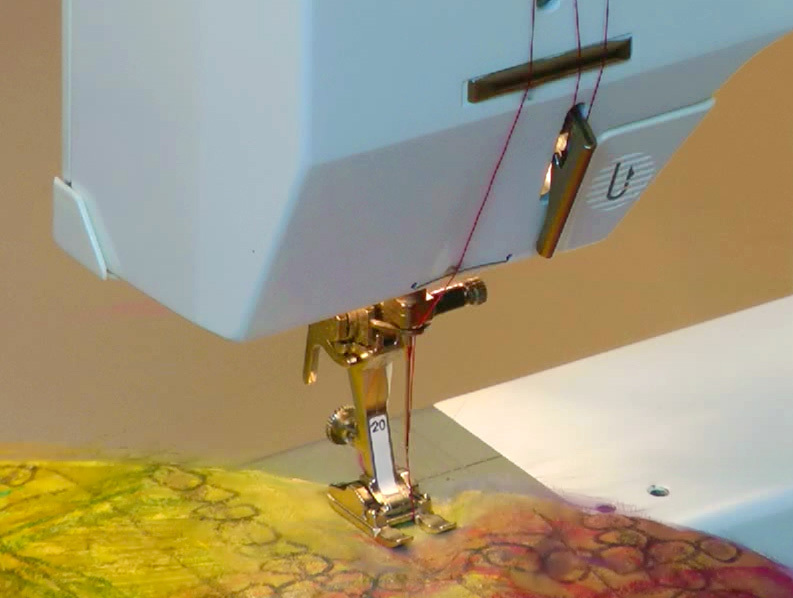 It's Sew Easy to Stitch on Fabric-paper. You need a sewing machine. Get a super sewing machine here. Make all kinds of beauties with your Fabric-paper. You only need some imagination. Begin with large white sheets of construction paper. Buy a package of my fav paper here. These come in yummy colors and are so easy to use. 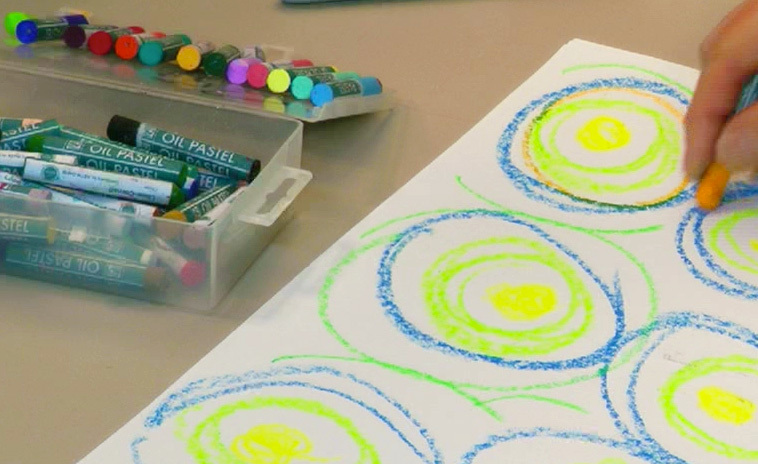 Get a great set of Oil Pastels here. Let your inner magpie out with Extreme Glitter paint and Dazzling Metallics paint! Get Extreme Glitter paint here. Buy Dazzling Metallics paint here. If you use paint, of course you need brushes. Get a great set of brushes here. Any container will do. No leaks, though! A paper palette or even a plastic lid is just fine. Get a paper palette here. You can never have too many Fine Line Black Sharpies. Get your Sharpies here. Like gold and other metal colors? You gotta get these pens from Krylon. Parchment Paper is perfect for protecting things. Get my favorite brand here. Light weight fusible interfacing makes this technique work. Get my favorite fusible here. 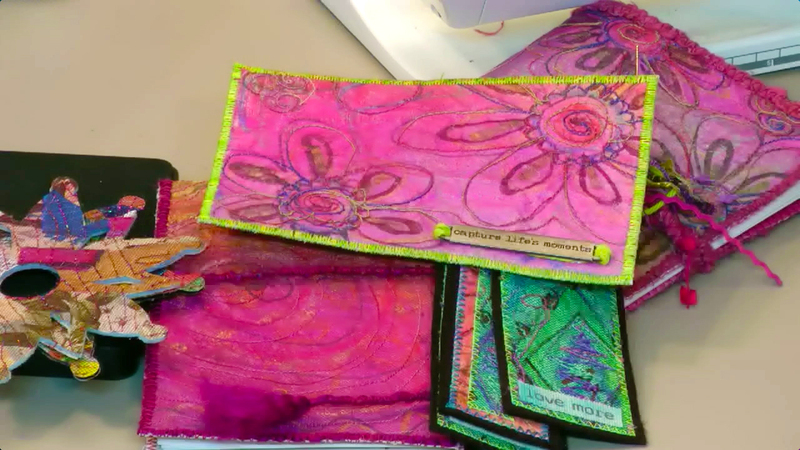 Learn a fun way to use Fusible Web in this class. Wonder Under is right here. Of course when using fusibles, you gotta have a good steam iron. Get an iron for your arts and crafts here. If you don't have a decent sewing machine, I'm here to tell you that you DESERVE one! You can get a nice sewing machine here. The BEST bobbin organizer, ever! Get it here. An open-toe presser foot increases your visibility SO much! Be sure to get the foot that fits your machine. See an example here. Ready to try free-motion stitching? You need a presser foot. Get the one that fits your machine! See a free-motion presser foot here. For thicker threads, Topstitch Needles work best. Get the needles I use here. Always use small scissors around your sewing machine. Get my favorite sharp little scissors here. Are you ready for the most amazingly gorgeous thread EVER? This is it! It's variegated and lasts a long time. Get King Tut thread here. This is a thicker variegated thread and the texture is fabulous. Be sure to use a topstitch needle. Get 12wt. thread here. Any kind of transparent fabric works great. Tulle is easy to find. Get my favorite Black Tulle here. I think we should lobby for 5 seasons instead of 4. The fifth one should be called Back-to-School and not just because the kids are getting back into a routine. It’s the time of year you walk into any office supply or discount store and the front aisles are filled and overflowing with new, delicious, colorful art supplies. Can’t you just smell all the artsy goodness when you enter the store? It can wake up your senses as much as evergreens and candy canes! Now, I’m sure the creators of these bins of goodness don’t label them as art supplies, but nevertheless, that’s what I call them and I stock up because the prices are super! Have you ever tried making Fabric Paper? It’s probably more fun than you should be allowed to have. Fabric Paper is simply a combination of paper and fabric put together in such a way that the characteristics of both are strengthened. 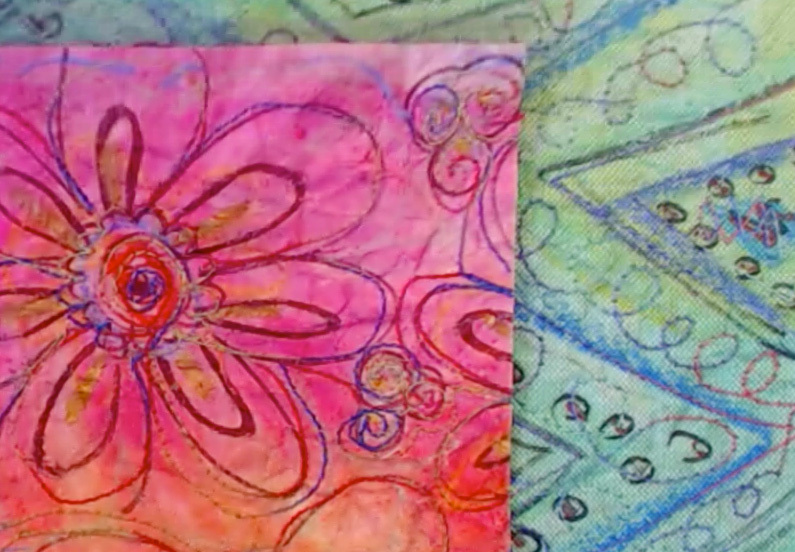 After playing with colorful shapes of oil pastels on paper, you’ll learn how to turn construction paper into a beautifully pliable, stitchable Fabric Paper. It’s an amazing, yet incredibly simple technique that doesn’t use messy glue nor does it require hours of drying time. BONUS! 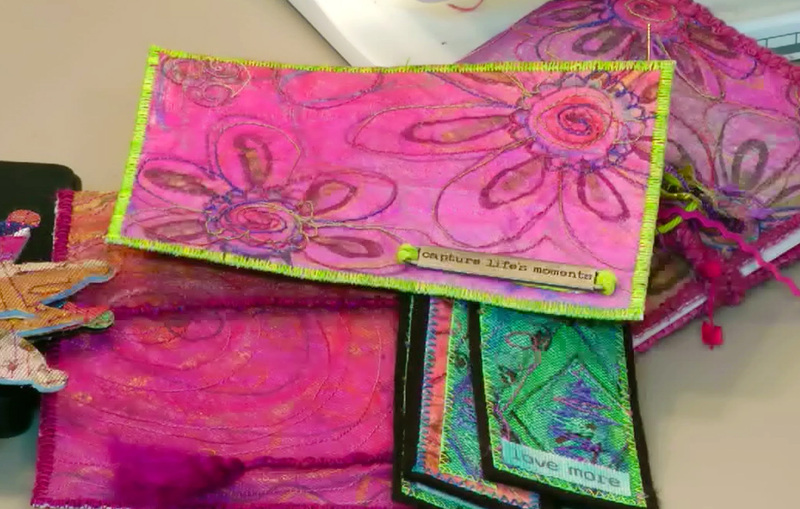 Although Fabric Paper isn’t washable, you can use it for all kinds of fun projects like journal covers, greeting cards or post cards, for wallhangings or art quilts, bookmarks, and you can even make your own charms and beads. I bet you’ll think of lots more ways to use your awesome Fabric Paper, too. Using construction paper is definitely not just for kids! Joining the class is really easy. Just click the button in the video and I’ll see you in class. Downlo﻿ad﻿ Text Only Class Notes for this video.